The evolution of Jewish prayer began in flames, liquidation and the Romans crushing the tiny state of Judea. Even after the Temple’s embers ceased smoldering, Jews could no longer serve God as He demanded in the Book of Leviticus. Prayers that never played a central role in the Temple Service, now emerged with resurrected significance alongside the Temple’s ruin. Jewish liturgy is the child of destruction. Yet, it soon converted to the voice of the downtrodden, a vehicle of hope and the official means for Jews to express gratitude towards their Maker over the last 2000 years. True, there has always been Jewish prayer. Abraham disputed; Rebecca sought. Jacob struggled; Moses fell on his face: all in prayer. To deny the historical actuality of Jewish prayer pre-70 is to ignore humanity’s universal need to seek out the Divine. We pray because we’re human. Biblical Judaism – probably as a polemic against this natural tendency – rejects prayer as a transcendent outlet. Instead we get our hands dirty, lighten our wallets a bit and serve our Deity by slaughtering animals by the myriads. Over the last 2000 years, starting with the Temple’s Destruction, Jews have been weaned off the Temple cult, culminating in some modern-day Rabbis even denying animal slaughter as an ideal worship that ought to be reinstated. After all, they could reason: words are abstract, beautiful… holy; and a cow is a bloody mess. A famous Rabbinic dictum declares that God considers the recitation of the Biblical verses on sacrifices religiously equivalent to one sacrificing animals in the Temple itself. Lovely that God’s eyes see no disparity, but how should we feel? Can I also internalize this theology of replacement, and accept wide-ranging Service of the heart? It appears that this can be compared to a person who loves playing basketball, and the Divine divulges that it is just as good to simply ritualistically utter an NBA handbook three times a day. While he might get credit in Heaven for such excursions, we have to question the experience’s equivalence to real substantial action. In the Temple, most animal offerings were eaten, at least in part, by the donor. In other words, BBQ was the Service. When we compare that – as the primary method of Service – with today’s manifestation – where prayer is primary – the sheer volume of liturgy recited cyclically in the pews should raise a few eyebrows. We replaced a holy dinner with recitation. And, Jews pray and pray a lot. But, why? Why do we pray so much? Why do people sit in the pews all day Yom Kippur, all morning Tishah be-Av and countless hours abound? When we look towards the Medieval Rabbis, the question is even further compounded. While Maimonides counts praying but a moment daily as one of the 613 Biblical commandments, Nahmonides on the other hand, claims that this minimal prescription does not even exist. For Nahmonides, at least on a Biblical level, prayer is not about thanking the Deity or building a relationship, but crying out to your Maker in a time of need. Thus, it is clear Rabbis created the prescriptive nature of the tri-daily version of prayer Jews recite, not God. While it is remarkable that most of what Jews do in synagogue daily is not officially deemed prayer by the Rabbis, every element of the service obviously fills some function. Meaning, apart from the Amida, almost all other elements of the prayer service serve some other function than formal prayer. For instance, morning blessings were moved to synagogue from the bedroom because people had trouble doing them at home. Pesukei Dezimra is meant to get you in the mood for what follows. The blessings before and after Shma, and the Shma itself, are recited to fulfill an alternative obligation. But none of these recitations are Halakhic prayer. Yet, when one considers synagogue life today on a typical Shabbat morning, with mesheberachs, prayers for the State, soldiers, Israel, etc., Av HaRaḥamim, An’im Z’miros, songs at the end of prayers, blessings on all aliyot, annual Torah recitation cycle, Haftorah, communal musaf, rabbinic speeches, long p’sukei d’zimra, etc., etc., etc., it is clear that one of the goals of synagogue itself is to keep you in synagogue. Evidently, just as Jews picked up vocabulary, food and dress over the last 2000 years of Exile from their host countries, they repeatedly enlarged the prayers as well and built it up piece by liturgical piece. One significant example of this phenomenon can be seen in the weekly Sabbath recitation of the Haftorah. No theologian or historian has definitively identified the circumstances that led to Jews to start reciting the weekly Haftorah, but proponents of one of the more famous explanations hypothesizes that Jews were forbidden to read from the Torah, so they instituted a weekly Haftorah reading so a Biblical text would still be read Shabbat morning during synagogue. Yet, when Jews were permitted to chant from the Torah again, the Haftorah remained an integral element of the Service. In other words, the Haftorah Service that was created because of persecution, somehow became embedded in the very consciousness of the Service, and could not be detached or omitted. The ball of foil grows and grows. Contemporaneous prayer is conceived and created by the exiled Jew for the Exile. For the free, BBQ is the Service; it is not ever-expanding. It is not expressing hope for redemption or a cessation of intermittent genocide. It is not having women recite the whole book of Psalms. It is not additional prayers for auspicious days. It is not slichot. It is joyous and physically orientated. The more Jews were raped, enslaved, slaughtered, maimed, and generally not in control of their own destiny, the longer prayer services have gotten. Indeed, expressions of sadness as well as happiness have become the domain of liturgy. The exiled seeks catharsis in words, not in action, as he has no control over his own fate. With the ingathering of the Jews, may we find reason for expressing our gratitude and hopes more concretely. I spent this past Shabbos in a small community. There is no standard prayer service on Shabbos day, as the local Reform Temple only meets Friday night. The local Chabad Shaliach and Orthodox locals meet Saturday morning, but they generally fail to make a Minyan unless several Orthodox travelers have a good reason to spend Shabbos there. Additionally, a monthly Conservative prayer service congregates in the same building as the Orthodox group, and I was lucky enough to be staying in that building this past weekend. I woke up early and prayed as I did not anticipate the Orthodox Minyan collecting ten men. So, at 10am when the two Services started, I decided to walk between the two services and meet some of the congregants. After playing with a 4 year old for a bit, I strolled into the Conservative Service right before they started to read from the Torah, and I got to witness something that really stuck with me. The gabbai/chazzan noted that there were at least four Kohanim or Bas Kohanim in the House, so they would have to resolve who to call up for the first aliyah. Then she noted that possibly their group self-identified as a truly egalitarian group, in a way that rejects the Kohen-Levi-Yisrael traditional trifurcation, in addition to patriarchal synagogue models. So, she decided to put it to a vote (even though this group has been meeting monthly for years, and probably encountered this issue every single previous prayer service). But, it seemed that this was the week the issue came to a head, and a decision must be made for the twelve person group. In the end, most people just nodded indifferently, so the Chazan said that the group would call a Kohen. Suddenly, a middle-aged woman in the corner raised her voice to declare her exasperation, exclaiming: “I don’t think we should call a Kohen. We shouldn’t have this outdated caste system! It’s disgusting and has nothing to do with our religion today. I find it offensive and heinous.” The group, for the most part, was surprised by the outburst. Clearly, the middle aged woman was very passionate about rejecting this Kohanic privilege and traditional standing. Yet, her eruption enjoyed such abhorrence lining her every word, that the four Kohanim in the crowd were somewhat flabbergasted by her stance. “Offensive… Heinous… Maybe we shouldn’t have these classifications anymore, but what she’s saying is a bit much,” one man said. After the discussion went back and forth a couple times, the Chazan realized that if she allows this debate to continue, she will not be able to finish by her self-imposed noon deadline for the conclusion of services. So, she noted that everyone’s opinion has equal weight and veracity, and that she would love to continue this pressing debate after prayers, but for now, they must start to read from the Torah. And so, who does she call up for the Kohen Aliyah? The middle aged woman. Wow! I couldn’t believe it. On the one hand, we can mollify our exasperation by claiming the Gabbai was trying to maintain order and affability among the group, but when we look closer, that did not happen. Everyone present, excluding myself and the two children, were mildly annoyed, and the hater got her way. As I took a step back, I wondered: why had the Chazan given the middle aged woman the Kohen Aliyah. I don’t think she was worried about a(nother) hissy fit. They group had already voted – with their lifeless head nods – and she ignored it. It seems in the past, they had called a Kohen without debate. What was different about today? It seemed to me that the chazzan was worried about the progressive nature of the Services. Or, to put it another way, that the Services should be flawlessly egalitarian in all ways. If democracy won out, one of the Kohanim should’ve gotten the first Aliyah. But as the chazzan was most worried about appeasing the reformist minded, tradition spurning, progressive Jew, everyone lost out. Her religion was manifest for everyone to experience, but it was not representative of the group. Ironically, Chazal were worried about this exact situation. Well, not that people would reject the Cohen-Levi-Yisrael trifurcation at prayer services, but, that the order of aliyot would lead to dissension, and that is why Chazal established a standardized sequence for aliyot. It is interesting to note, Rambam writes (Gittin 5:8) that “it is common that the Kohen gets the first aliyah even if there is a sage, but this has no source in the Torah at all or in the Talmud…” Rambam appears to favor giving aliyot to the greatest Torah sage present at Services. Yet, traditional Jewish society has rejected this model in favor of the Kohen-Levi-Yisrael model, for several reasons, but not least of to make sure that there’s no fighting at synagogue. Next time I’m there, and I assume the topic is uncomfortably debated again, I’ll have to keep the chuckle to myself as I acknowledge Chazal’s insight into prayers. It has virtually become a truism: religious practitioners believe that God created the world ex nihilo, while atheists put their money on the Big Bang – and subsequently evolution – for their own cosmogonic picture. This division, though, is no longer limited to the worlds of theology and physics alone. Today, the media, political parties, the Supreme Court and even public schools have joined the debate by also bifurcating into one of two camps: the God-fearing or the Godless. Consequently, as time passes and the propaganda multiplies, the chasm separating the two yawns farther apart making reconciliation less and less likely an option for two so myopic stances. This insurmountable divide is all the more surprising when one notes how little the majority of both groups actually grasp of the pertinent arguments. Unfortunately, Isaac Asimov’s estimation that “[t]ens of millions of Americans, who neither know nor understand the actual arguments for – or even against – evolution, march in the army of the night with their Bibles held high,” can be equally applied to hordes of evolutionists brandishing their favorite personal argument from evil. There can be no doubt that most atheists who fall before evolution’s supremacy cannot even enumerate Darwin’s most pivotal contributions to evolutionary biology or the humanities – let alone the five historical epochs the evolutionary theory rests upon. Similarly, as Asimov posits, their religious equivalents would be just as hard pressed to explicate a medieval exegete’s or a Church Father’s approach to a particular topic of the creation narrative. With few exceptions, most people simply recognize that their own position is true without troubling themselves with all the fine points or the facts of the issue. The two sides, however, rest upon unequal grounds. Creationists – who for the most part garner their approach from the Bible – possess a plethora of available approaches in which to construe the Bible’s cosmological account when faced with practical difficulties. Atheists, on the other hand, are to a great extent trapped by their own beliefs. What is the alternative to some form of evolutionism? – to believe the world is the product of a purposeful Creator – that is the exact notion they seek to exclude. By default, as the evolutionary theory is the only viable alternative to creationism and God, atheists side with the less God-infused approach. Notwithstanding the transparent agendas present on both sides of the picket lines, we need not take for granted the necessity for such polarized factions and concise schisms. Today, we possess the proper philosophical and historiographic tools to question the necessity of the aforementioned truism. Is it truly necessary that atheists gravitate towards evolution instead of its alternative cosmological picture: creatio ex nihilo, or that creationist and evolutionist camps be consistently represented by theists and atheists respectively? Is it a historical accident that this correspondence became the case, or was there no other way for history to play itself out? While the apparent impetus that leads creationists and evolutionists to gravitate towards a respective cosmological camp is clear, the actual root of the argument lies much deeper than the issue of theism alone: many times, cosmology is just the face for much more serious concerns. Accordingly, we will scrutinize the philosophical and theo-political assumptions underlying the various methodologies employed by several religion traditions in their interpretation of the opening lines of the Genesis narrative. By doing so, a more-clear and accurate picture of the various camps’ motivations will materialize. Subsequently, we will show why evolution need not be equated with atheism. Even though the Talmudic Sages may have already proffered an interpretation of a biblical verse, the medieval biblical exegetes (Rishonim) boasted a certain leeway in rendering a verse according to the p’shat (simple read) over its Talmudic treatment. This does not mean that some exegetes were not extremely reliant on the Talmud’s and Midrash’s exegesis, but, nonetheless, a Rishon could still accept, reject, or amend the Talmudic treatment of a verse to better fit with his own exegetical and philosophical underpinnings. Accordingly, along with the power to elucidate the Divine text, the traditional commentator bears the daunting task of wielding God’s stamp of truth with every penned word. Historically, this license has seen the Bible pass through the hands of Gnostics, neo-Platonists, mystics, rationalists and fundamentalists, without ever arriving at a clear consensus of who, if any, should be the true torch bearer. With this in mind, we will analyze the staples of medieval biblical exegesis not to see what they said, but by reading between the lines, to see why they commented as they did. Generally, it is exceedingly difficult to uncover a commentator’s motives or underlying assumptions; to some, it is heresy to even intimate that the biblical exegete has any agenda. Accordingly, we will limit our examination of each exegete to his commentary on the Bible’s initial verses. By analyzing commentary on the same verses, the variance and disagreements between the exegetes itself will be telling of the specific methodology employed. And we shouldn’t let the simplicity of the King James translation induce us into thinking the first verses are noncomplex or monolithic; the array of following commentaries will make it evident that the Bible’s initial words are anything but obvious. In this reconstruction of the opening verses, he inserts a noun into the narrative in order for the verse to read properly. Accordingly, the Bible does not inform the reader of the actual order of creation in its first two verses; they are simply prefatory to the rest of the Genesis narrative. R. Yizhaqi further buttresses his claim by pointing out that the Bible only later specifies that the Heavens were formed on the second day (so they could not have been created on the first day) and that the spirit of God seems to hover over the surface of the waters (even before they were ever officially created on the third day). R. Yizhaqi’s insistence on interpreting the Bible’s first word in line with the verse’s true grammatical structure forced him to: (1) assume the implied word ‘creation’ in the initial verse, (2) interpret the verse as an introductory sentence, and thereby keep a literal translation of the latter half of the verse (as actually referring to the Heavens and the earth) as well, (3) render the prefix vav (and) that precedes the second verse as a conjunction meaning ‘when,’ instead of its more common rendering as the connective ‘and,’ and last (4) accept the Talmud’s assertion that the Heavens were constructed from fire and water. Accordingly, R. Yizhaqi is not swayed by any political or philosophical motives; what he believes to be the best read, the p’shat, is the final litmus test for him (in this case); his philosophy is formed and molded by the best read of the text. R. Abraham Ibn Ezra (1092-1167), who is renowned for his outstanding grammatical expertise, focuses instead on the diction of the verses at hand. Following suit with other Jewish neo-Platonists of his era, R. Ibn Ezra rejects the commonly accepted understanding of ‘בראשית’ as referring to creation ex nihilo for philological reasons. He cites verses 21 and 27 as defeaters for the thesis that ברא refers to creation ex nihilo, for those verses use the term ברא in a context that clearly indicates that the entity was not created ex nihilo. Bearing this in mind, R. Ibn Ezra concludes that the etymology of the first word in the Bible (ברא) refers not to ‘creating’ but to the ‘cutting’ or ‘setting boundaries’ of something that had already existed. Accordingly, he is able to justify the Neo-Platonists’ contention that an original matter existed for which God ‘cut’ or ‘set boundaries.’ Hence, the Bible itself lends support for R. Ibn Ezra’s neo-platonic understanding of the world’s beginnings. Nachmanides (R. Moshe ben Nachman, 1194-1270) has a different agenda altogether. From the very start of his commentary on the Bible, he highlights that those who reject creatio ex nihilo reject the Torah of Moses. For there is a great need to begin the Torah with ‘In the beginning God created,’ for that is the basis of our faith, and someone who does not believe in it, but thinks that the world has existed eternally, he is a heretic in a fundamental, and has no connection to Torah at all. In line with his focus on creation ex nihilo, Nahmanides is forced to interpret the first verse in its colloquial non-literal sense ‘In the beginning,’ instead of R. Yizhaqi’s more precise translation of ‘In the beginning of.’ Owing to this understanding, Nachmanides explains the other two key terms of the verse “the Heavens and the earth” (השמים and הארץ) non-literally as well, given that the Bible proclaims the Heavens were created on the second day. Nahmanides understands that the usage of the two terms in the first verse designate the potential for all future stages of physical reality. In other words, God executed one act of creation; an infinitely small substance was first created and then it went through a kind of non-Darwinian evolution (a form of super evolution) with the hand of God directing the world’s formation and development. He explains the phrase “the Heavens and the earth” in light of his contemporary Greek knowledge. They correspond, first to the hyle matter, and subsequently, to the four primary elements. Far beyond the two explanations of the aforementioned medieval exegetes, Nahmanides is willing to completely undermine the literal sense of the first verse in order to buttress his philosophical and scientific framework. I believe every possible happening that is supported by a prophetic statement and do not strip it of its plain meaning. I fall back on interpreting a statement only when its literal sense is impossible, like the corporeality of God; the possible however remains as stated. Obviously, R. ha-Levi understood that a person must follow his own perception of truth. Similarly, Maimonides did not feel obliged to follow the literal sense of the Bible where it led him towards philosophically or scientifically inadmissible conclusions. So, we have seen that the four aforementioned exegetes each present widely differing criteria (and methodologies) for interpreting the opening verses of the Genesis narrative. R. Yizhaqi focuses on the grammatical integrity of the verse, R. Ibn Ezra upon the diction, Nahmanides highlights his own philosophical and scientific underpinnings, and Maimonides accepts the literal understanding of the verse until it is contradicted by some demonstrated truth. This bias in the exegetes’ interpretation of the Genesis narrative, especially prevalent in Nahmonides’ approach to the opening verses of Genesis, is equally evident in the Christian approach to creation. The Christian right of America, generally identified with the Evangelical or conservative Protestant movements, has promoted a take on creationism that is based on a hyper-literal reading of the Genesis account. They have aligned themselves with the scientific creationist movement (or young-earth creationists) who believe that the world is less than 10,000 years old. Much to the surprise of many, scientific creationists refrain from claiming that all of their insights into the creation and subsequent development of the world are explicitly stated in the Bible; rather, they piece together a cosmological picture based on the logical implications of a holistic read of the Bible, embracing modern science when it buttresses their argument. To be able to piece together such an integrated cosmological picture is obviously an exceedingly tough task, but to construct one that fits accurately with the suppositions of both archaeology and science is daunting. The much heralded former engineering professor-turned-anti-evolutionist, Henry M. Morris, has assembled such a picture, and has so effectively promoted its validity, that approximately forty percent of the American population regard Morris’ picture of creationism as correct. Of course, the fact that he has founded a journal, an institute for creation research, a college (Christian Heritage College) and has written over fifty books including his three-volume boxed set The Modern Creation Trilogy, may have helped a bit. In other words, if one wants true scientific ratiocinations without all the fuss of the scientific method, one need look no farther than the Bible. Evolutionary theory, along with all other scientific notions that contradict the literal sense of the Bible should be disregarded, for who knows science better than God – the founder of the rules of science. Within the ranks of scientific creationists, there are no secular thinkers or apologists for the “Word of God” in the Bible. The Bible is the most vital and central book that guides their lives and it contains nothing but truth. They are taught from the earliest days of their youth the Biblical stories and the centricity of Jesus Christ. But, one has to wonder why the Christian right has put so much effort into promoting their cosmological approach. Besides journals, a seemingly endless array of creationist books, and a college, they have even built a twenty-six million dollar Creation Museum in Petersburg, Kentucky – a 60,000 square foot museum built on five acres of flatland and designed by an ex-Universal Studios exhibit director that presents an alternative theory to that of evolution – and they plan on making several more in other American cities. With this kind of high-tech hype, overwhelming media attention on the internet, and in the news, as well as the seemingly endless public school debates – the Scopes trial was over eighty years ago! – it would seem that this is the key issue that Protestants fight for in America. What Christian issue is given more prominence in the news than creationism? Ironically, as of late, the world is exposed to less “Jesus talk” and more creationism. However, we should wonder: is this issue truly the key issue between the conservatives and the rest of the world that Christians willing go into battle over – and if it is, then why? One would imagine that the notions of Jesus’ Messiahship, the notion of salvation or the Afterlife would be higher on the laundry list than promoting Old Testament creationism. In order to understand the pivotal role that creationism must play in Christian theology, we will look towards the roots of the Protestant Reformation. Before the sixteenth century, many other groups splintered from the Church before Martin Luther (1483-1546) – an Augustinian monk and professor of theology at the University of Wittenberg – triggered the bifurcation of the Church. These revolutionary groups sought to reform the Church and its teachings, though never intended to disunite Christendom. Nonetheless, until the pope officially recognized certain splinter groups, they hung in limbo on the narrow stretch between orthodoxy and heresy. Like the Waldenses of the 11th century, the English cleric John Wycliffe (1328-84) and the Bohemian priest Jan Hus (1373-1415), these dissenters knew that there was something awry in the Church and its teachings, and aspired to repair it. The hallmark of the Protestant Reformation, like the Karaites before them, was the importance placed on the primacy of Scripture – individualistic, subjective reading of the Bible, that recently has led to a hyper literalistic approach to reading the Old Testament. The root cause of Luther’s protestations was his own Church experiences in the 16th century. While the Church decided early on to reject the obligation to uphold most of the Biblical commandments and ritual cult, Luther pined over the fact that the modern incarnation of the Church simply replaced the old commandments with a litany of new commandments, sacraments and indulgences, none of which were clearly indicated in the New Testament. They rejected one set of laws, only to impose a whole other set – a set completely determined extra-biblically. Luther felt that the Catholic Church had missed the boat and was prescribing exactly that which Pauline Christianity came to wipe out. As Luther’s Protestant views came into focus, next to sola fide and sola gratia, stood sola scriptoria, the Scripture principle. With the primacy of Scripture as the fundamental principle upon which all Protestantism rests, it is clear why Christian conservatives put so much weight on the actual words of the creation narrative. In contrast to medieval Catholicism, which was content to interpret the Bible allegorically or spiritually, Luther insisted on the literal sense of Scripture. Accordingly, if the Protestant movement abstained from upholding the literal truth of any aspect of the Bible, then their whole argument against the Catholic Church would be completely undermined. Hence it follows that in and of itself, the creation narrative may be relatively unimportant from a Christian perspective, for Jesus’ message would be true independent of which creation process God chose to implement. Nonetheless, the opening verses of the creation narrative must remain literally interpreted as it rides upon the coattails of other more significant Protestant theology that also must be interpreted literally. For if one can challenge or undermine the Bible’s message or intent in one area, there is nothing to stop people from doing so in other areas. For once we allow even the points that are less important and non-crucial to be interpreted allegorically, symbolically, metaphorically, etc., then we open the Pandora’s Box that ends with the vindication of the Catholic Church, the sacraments, indulgences and its overwhelming authority. Unlike Conservative Christians, Catholics are in no way bound to the literal reading of the Old or New Testament. To the contrary, commentators within the Catholic world have produced countless interpretations of the Genesis narrative, from significantly different vantage points, and will continue construing the text based on the archeological, scientific and philosophical findings that arise in each generation. The Church has not institutionalized an official way to read the Genesis narrative, and unless the Church actually deems some way to be heretical or to be officially binding, all may carry on producing their own stances on most of the Genesis account. a system which is so repugnant at once to history, to the tradition of all peoples, to exact science, to observed facts, and even to Reason herself, [it] would seem to need no refutation. Did not alienation from God and the leaning toward materialism, due to depravity, eagerly seek a support in all this tissue of fables. New knowledge leads us to the realization that evolution is more than a hypothesis. It is indeed remarkable that this theory has been progressively accepted by researchers, following a series of discoveries in various fields of knowledge. The convergence, neither sought nor fabricated, of the results of work that was conducted independently is in itself a significant argument in favor of this theory. Besides recounting that man is created in the image and likeness of God, Pope John Paul II does not deal with any other details of the Genesis narrative in this essay. For his purposes here, they are completely worthless. The importance of the Genesis narrative lies in the details involving man’s relationship to God; the rest – the vast majority of the narrative – need not worry the theologian or the scientist. theories of evolution which, in accordance with the philosophies inspiring them, consider the mind as emerging from the forces of living matter, or as a mere epiphenomena of this matter, are incompatible with the truth about humanity. Thus, Pope John Paul II accepts the conclusions of scientists, but only as long as they do not contradict “revelation.” But what does Pope John Paul II mean by “revelation?” For those of the Jewish or Islamic faiths, revelation would denote either the Divine words recorded in the Tanakh or the Qur’an respectively. So we might be suckered into thinking that the Pope means to imply the messages found in the Old or New Testament by his usage of the word “revelation;” but really this is not the case. In truth, Pope John Paul II is unconcerned with the doctrines or dogmas put forth by the Holy writings. Even his treatment of the man’s image and likeness of God stands upon the interpretation put forth by the conciliar Constitution Gaudium et spes that human beings are “the only creature on earth that God has wanted for its own sake.” Definitely an interesting and promising interpretation, but by no far stretch the only possible one. But from Pope John Paul II’s perspective, that is the main drive of Genesis narrative – the centricity of mankind before the Lord. Also, the Church Fathers Origen, Clement of Alexandria, Justin Martyr, St. Irenaeus of Lyons and many others put forth non-literal interpretations to several verses or even the whole of the Genesis account. It is as much part of the Church’s tradition to deal with verses as it sees fit as any of its other catecheses. In order to understand this leeway of interpretation, we must first understand the foundation of the Church itself. The Church’s catechesis summarizes the primary details of Catholic belief including orthodox trinitarian Christianity, as well as the belief that Jesus set up the Church around the twelve apostles on earth before he died. They cite the Gospel According to Matthew as the source for Jesus’s appointments of the Church; the verse states: “And I say also unto thee, That thou art Peter, and upon this rock I will build my church; and the gates of hell shall not prevail against it.” While the present Pope is viewed as Peter’s (head of the Early Church) contemporaneous successor, bishops are the modern day successors to the apostles. This organization of the Church is kept from doctrinal error by the guidance of the Holy Spirit. The Sacred Magisterium infallibly teaches and interprets the truth of faith. Accordingly, Catholics consider their philosophical viewpoints as produced by the Holy Spirit and the Church, for the most part, as infallible. This fact is easy to see within the world of doctrinal beliefs, but it also holds true for Biblical exegesis. A surprising corroboration for this method of interpretation can be found very early on in the Gospel According to Matthew (subsequently referred to GAM) 2:23 which (possibly) quotes the verse from Isaiah 11:1 to prove that Jesus returned to Nazareth to fulfill the alleged prophecy from Isaiah: “He will be called a Nazorean.” First of all, this prophetic fulfillment is anything but: if the quotation’s source is Isaiah (11:1), the verse calls the Messiah a branch (נצר), while the verse from the GAM clearly is referring to the city Nazareth, which would have an altogether different Hebrew root (נזר). Possibly, this prophetic fulfillment could be accounted for by transliterating the Hebrew letter zadi (צ) as a Greek zeta (ς). Still, even in a transliterated text could account for the Matthean usage, it is hard to believe that this prophetic fulfillment would convince any of Jesus’ followers. First, the city of Nazareth is not mentioned once in Tanakh, so there can be no prophetic fulfillments involving the famed city. Next, the GAM assumes that it was God who directed Joseph to Nazareth, yet this is not the case; the angel merely told Joseph to enter the land of Israel. There is no evidence that Jesus’ family were directed or even intended to reach Nazareth. Last, and most importantly, no where in the prophetic writings, or any writing besides the GAM, does any one claim regarding the Messiah that “He will be called a Nazorean;” the Evangelist simply made it up. So what was the author of the GAM trying to accomplish by misrepresenting the Isaian prophecy? In the use of the OT in the New, implicit Midrash appears in double entendre, in interpretive alterations of OT citations and in more elaborate forms. The first type involves a play on words. Thus Matthew 2:23 cites Jesus’ residence in Nazareth as a “fulfillment” of prophecies identifying the Messiah as Nazirite or a netzer. From this example, it is evident that already in the period of the writing of the New Testament, Evangelists assumed that they enjoyed the authority to construe the Old Testament to buttress their own theology, very much as the rabbis exploited a similar methodology through the use of Midrashic exegesis. With the exception of the early second century movement Marcionism – which rejected that the vengeful god of the Old Testament was identical with the loving god of the New Testament – the Old Testament was always a ripe source for the Evangelists to procure prophetic fulfillments, messianic ideology and pseudo-Jesus references. Just as these Old Testament construals were deemed by the Early Christian to be accurate and true in God’s eyes, analogously, the Catholic Church also feels that they may construe the Testaments however they see fit. The existence of the Church’s Divine right to authoritatively interpret the Bible might explain why it took so many centuries for the Church to encourage Bible study, for the literal sense of the text does not convey Divine truth; rather, Divine truth rests solely within the authoritative interpretation of the Church. Therefore, some verses will be construed away from their obvious meaning, while others may be (seemingly) totally disregarded: accordingly, grace is not a free gift of God; it is gift to those who accept and follow the whim of the Church. Well, Malunkyaputta, anyone who demands the elucidation of such futile questions which do not in any way tend to real spiritual progress and edification is like one who has been shot by an arrow and refuses to let the doctor pull it out and attend to the wound. If the weakened man were to say, “So long as I do not know who the man is who shot me… until then I will not allow the arrow to be pulled out or the wound to be attended to.” – that man, Malunkyaputta, will die without ever knowing all these details. A holy life, Malunkyaputta, does not depend on the dogma that the world is eternal or not eternal and so forth. Whether or not these things obtain, there still remain the problems of birth, old age, death, sorrow… all the grim facts of life – and for their extinction in the present life I am prescribing this Dhamma. Accordingly, bear it in mind that these questions which I have not elucidated… I have not elucidated purposely because these profit not, nor have they anything to do with the fundamentals of a holy life nor do they tend toward Supreme Wisdom, the Bliss of Nirvana. Just as the Buddha’s parable shows that Malunkyaputta may squander his life away by focusing on matters that do not lead one towards achieving the purpose of life or nirvana, so too, a good Catholic practitioner may miss the boat by speculating about metaphysical issues without the assistance of the Church’s authoritative positions. Really, the Church, like Buddha, places no emphasis on metaphysical notions that do not lead a person to observe the proper holy life as defined by their own respective dogmas. Whether the earth was created ex nihilo, or is eternal, or is the product of some five and a half billion years of evolution is religiously worthless; as long as one’s stance does not undermine the Church’s message and authority, any of the possibilities could be made to jive with the diction of the Bible; the Church’s Divine hermeneutic license ensures as much. Everything in the world today is still as it was created. This was an entirely logical conclusion based on the known facts at the time the Bible was written. Some theologians, on the basis of the biblical genealogy, calculated that the world was quite recent, having been created in 4004 B.C., that is, about 6,000 years ago. But today, when creationism is not the logical choice, the Catholic Church feels no obligation to fall before the literal sense of the Bible. Evolution is accepted, not because it is the best read, but because Catholics are not truly interested in the best read. Indeed, there is no intended interpretation that we should discern on our own; there is only the canonical interpretation which the Church alone may define. Today, science is as accurate, if not a better source of the natural sciences as the Bible. In Catholicism, what matters is the hierarchal structure; knowledge of how the Bible said that God created the world is insignificant apart from the Church’s interpretation. And now my beloved brothers, see on what a sound basis our Torah stands. For this secret [of the world’s destruction and recreation] handed to us from our ancestors, revealed to us hundreds of years ago, can be found in nature in our own time in the clearest manner. The restless spirit of man, the desire to discover all mysteries, has [brought him to] dig and search the belly of the earth like a mole, as well as the highest of mountains, the Pyrenees and Carpathian, and in the Cordilla mountains in [South] America, as well as the Himalayas, digging and searching until they found an awesome order of fossils, one on top of another at a hair’s distance, where one can assume that a word of catastrophe was caused through the His Divine hand, which sends fury through the land and causes it to tremble…They found in 1807 of their calendar, in Siberia, in the north of the earth under the permanent layer of ice, a mammoth elephant… Also the remains of fossilized sea creatures have been found within the highest mountains. From all this, we can see that all the Kabbalists have told us for so many years about the repeated destruction and renewal of the earth has found clear confirmation in our time. I believe, as science teaches, that animal forms appeared on the earth and evolved into more perfect beings… More and more perfect species have developed, one after the other, over the course of millions of years on the face of the earth. The most perfect form is Man. But will nature stop here? This would indeed be strange. Present humankind, as Renan says, will evolve into another, more prefect human being… All this is stated by Judaism, and is called the Resurrection. One can only speculate about how R. Lipschutz and R. Benamozegh would further integrate today’s evolutionary theories and concepts into their own Kabbalistic and philosophical outlooks. Nonetheless, we can see that, at least initially, the evolutionary theory was not looked on as a frightening idea sure to shake the core of Jewish beliefs. However, one could make the case that this acceptance of modern science was only welcomed because it did not uproot any of their fundamentals of faith; had the scientists proffered conclusive evidence that for the validity of polytheism or that Zeus truly created the world, we could be sure that R. Lipschutz, R. Benamozegh and other Jewish theologians would surely censure such evidence and question the validity of the scientists’ findings. This is exactly how the late Lubavitcher scion, Rabbi Menachem Mendel Schneerson (1903-1994) acted, along with most ultra-orthodox rabbis of the last fifty years in the face of evidence that the world is more than six thousand years old. So, we must conclude, theologians are stuck upholding their tradition sometimes even against the pangs of science, but are atheists stuck upholding the evolutionary theory? We will observe that atheists are not actually stuck in the same corner as the theologian. Really, the evolutionist’s corner was self-made, and that corner, actually, is just an accident of history. To illustrate this point, we will turn to the infamous Dan Brown and his other novel, Angels and Demons. The book’s beginning chapters describe how the Catholic priest physicist, Leonardo Vetra used the world’s largest particle accelerator to create anti-matter; in other words, he was able to simulate the Big Bang. He reasoned that his machine would render viable proof to the fact that God exists in that his machine works in the same way in which God originally acted in creating the universe. While the premise of this argument might seem tenuous at best, really, it is not one to be scoffed at. The medieval exegete-philosopher Gersonides (1288-1344) accepts a Platonic account of the universe’s origins based solely on the fact that it is a logical contradiction for new matter to be created. Hence, for him, not even God could create ex nihilo. Let us take Brown’s fiction into the realm of reality. Let us imagine that scientists were able to create such a machine: so, within the normal rules of the physical world, it is the case that sometimes things are created ex nihilo as Vetra’s machine could. Because this machine works without the direct assistance of a deity, the scientific world would have produced an alternative to the first step of the evolutionary theory, i.e. the Big Bang; as of today, there is no alternative cosmological picture for atheists. This being the case, Vetra’s machine would offer the atheistic community the alternative to evolution that they never had. Given the possibility of a scientific alternative to theistic creationism before the theory of evolution was ever hypothesized, the world’s atheists would have happily joined the “creatio ex nihilo machine” bandwagon. That machine would offer the atheists an alternative approach – a scientific approach – to explain the world’s beginnings. Therefore, creation ex nihilo would be an equally viable option for the atheistic scientific world (even though evolution would still be an option). Really, it is an historical accident that the evolutionary theory became the foundation of the atheist movement. The atheists’ stance is not a case of fact (evolution) flowing from the theology, but theology following fact. There is nothing whatsoever within atheistic dogma that forces one to side with evolution. Really, had the world played out differently, creation ex nihilo could have been associated with the God deniers, while evolution would be, at best, a competing theory. I have always felt that due to some erroneous conception, we have actually misunderstood the Judaic anthropology and read into the Biblical text ideas which stem from alien sources. This feeling becomes more pronounced when we try to read the Bible not as an isolated literary text but as a manifestation of a grand tradition rooted in the very essence of our God-consciousness that transcends the bounds of the standardized and fixed text and fans out into every aspect of our existential experience. Nonetheless, R. Soloveitchik’s assertion should not be surprising, nor alarming. Most of the scholars who take the time to put forth integrated, well-thought out commentaries on the Bible, are those who are invested in its message and live according to its guidelines, as they interpret them. Therefore, of course they will interpret the Biblical narrative in line with the mores and values of their society. No matter what one’s religious orientation, and regardless of one’s acceptance of theism, we have seen that people will do what it takes to ensure that their own beliefs are manifest, not only in the physical world, but also in the Divinely inspired texts. Isaac Asimov from Science on Trial by Douglas Futuyama (New York: Pantheon Books, 1982), p. 175. For example, creatio ex nihilo, neo-Platonism, and allegorical positions (including apologist, accommodationalist, and scientific) are some of the valid approaches available to biblical exegetes. It is not uncommon for R. Yizhaqi to allow for implied words in the Bible. He proffers four other examples: Job 3:10; Isaiah 8:4, 46:10 and Amos 10:12. Rashi’s commentary on Genesis 1:1. And, based on the grammatical nuances of the verse, he will accept the Midrash that best fits the exegetical issue he is addressing. Nachmonides commentary on Genesis 1:1; see also his commentary on Exodus 13:16 (D”H Ve’Atah Omer) and Leviticus 25:2 (D”H VeHene Ha-Yamim). According to Nachmanides, the whole verse is lav davqa – each word is not to be taken in its precise meaning. Treatise on Resurrection, from Crisis and Leadership: Epistles of Maimonides, trans. Abraham S. Halkin. and D. Hartman (Philadelphia, 1985), p. 228. See Maimonides, Guide for the Perplexed, (trans. Shlomo Pines, Uni. of Chicago Press, 1963), II, 30. Some Evangelical Protestants take the “catastrophic approach” to creation. This approach (which parallels the modern Ultra-Orthodox understanding of creation first proposed by Kabbalists who interpolate the literal sense of the creation account with several Midrashim and Aggadot) hypothesizes that several worlds were created and destroyed on earth before the present epoch came into being. This approach, though, is exceedingly less common than the simple literal read of the Genesis account among Evangelicals. Furthermore, Protestants submit other approaches to creationism including the “gap theory” adopted rather early by Cyrus Ingerson Scofield (1843-1921) and the “day-age” theory, still agued today by Hugh Ross in his Fingerprint of God: Recent Scientific Discoveries Reveal the Unmistakable Identity of the Creator, 2nd ed. (Orange, California: Promise Publishing, 1991), and several other concordist approaches. Morris and Morris, Modern Creation Trilogy, 1:13/14. In 1925, the Tennessean high school teacher John Scopes was found guilty of violating the law against teaching evolution in the class room. This was the case regarding the Franciscan Order in 1210 and the Dominican Order in 1216. Luther relied on the teachings of Paul that grace is a free gift of God and that faith alone justified a sinner to effectively call into question the Church’s whole ritualization of Jesus’ message. We do not intend to enter the debate whether Luther is begging the question by basing his interpretation of Christianity and critique of Roman Catholicism almost exclusively on Paul’s interpretation of Christianity. According to Luther, the super-structure of the medieval Catholic Church arose by departing from the literal sense of Scripture. He understood that the Bible itself is to provide the checks and balances; in fact, Luther and Calvin insisted on Scripture providing the foundations of a prophetic critique paralleling the prophetic rejection of the super-structure of pre-exilic Israel. For example, with no literal Fall or transmission of Adam’s curse to the rest of humankind, there is no necessity for Jesus’ death. Ironically, the hallmark of the Protestant movement, as well as the reason that there are more than ten thousand branches of Protestantism in America alone, is the freedom to interpret the Old and New Testament as one sees fit. Yet, when it comes to creationism, even though grammatically, philologically, and exegetically, there are other, of not better ways to read the text, many Protestants hold fast in their alleged literal reading of the text. In this way, the Catholic Church’s approach to exegesis closely parallels the method employed by the Jewish medieval exegetes, while the modern Protestant approach to exegesis exactly corresponds to contemporary right-wing Jewish commentaries in their censorship of non-literalism. Science on Trial by Douglas Futuyama (New York: Pantheon Books, 1982), p. 24, from Andrew Dickson White, A History of the Warfare of Science with Theology in Christendom, Vol. 1 (London: Macmillan, 1896; reprint ed., New York: Dover 1960). Evolution and the Living God, Pope John Paul II chapter 9, Peter’s Science and theology, pp. 149-152. Cf. Acta Apostolicae Sedis 42 (1950), pp. 575-6. The Church believes in some form of theistic teleological evolution. Cosmogony and cosmology have always aroused great interest among peoples and religions. The Bible itself speaks to us of the origin of the universe and its make-up, not in order to provide us with a scientific treatise, but in order to state the correct relationships of man with God and with the universe. Sacred Scripture wishes simply to declare that the world was created by God, and in order to teach this truth it expresses itself in the terms of the cosmology in use at the time of the writer. The Sacred Book likewise wishes to tell men that the world was not created as the seat of the gods, as was taught by other cosmogonies and cosmologies, but was rather created for the service of man and the glory of God. Any other teaching about the origin and make-up of the universe is alien to the intentions of the Bible, which does not wish to teach how heaven was made but how one goes to heaven (Pope John Paul II, October 3, 1981 to the Pontifical Academy of Science, “Cosmology and Fundamental Physics”). Obviously this is a statement that Paul would deny; nevertheless, in practive, what drives the Church is not the literal sense of the text. The Church always finds a way to interpret the Bible consistent with their beliefs. Origen says that “we have treated to the best of our ability in our notes upon Genesis, as well as in the foregoing pages, when we found fault with those who, taking the words in their apparent signification, said that the time of six days was occupied in the creation of the world” (Against Celus 6:60). See St. Augustine 2:9; also see 1:19–20, Chap. 19. The Magisterium is headed by the Pope who serves as the primus inter pares (first among equals) over the rest of the bishops. Similarly, when a ‘צ’ is transliterated into English, many times, an author will simply write a ‘Z’ with a dot under it. See BT Shabbat 117a where the word ‘בי נצרפי’ appears referring to the annex of a church. Charlesworth (Charlesworth, James H., & Weaver, Walter P. The Old and New Testaments. Valley Forge, PA: Trinity Press International, 1993) says “to many Christian readers, to say nothing of the Jewish reader, the NT’s interpretation of the Old appears to be exceedingly arbitrary,” (p. 209), and that’s putting it lightly. Goodwin, Mark J. (April 2005). Hosea and the “Son of the Living God” in Matthew 16:16. Catholic Biblical Quarterly, 67 No. 2, pp. 265-283.
 p. 202, E. Earle Ellis in “How the New Testament Uses the Old” in New Testament Interpretation. Edited by I. H. Marshall. Grand Rapids: Eerdmans, 1978. At Vatican II, the council concluded that both clergy and laity were to continue making Bible study a central part of their lives. This only reinforced Pope Pius XII’s encouragement of scholars to study the Ancient Biblical languages for a better grasp of the original meaning of the text, in his 1943 encyclical letter Divino Afflante Spiritu. Majjhima Nikaya, I, 1966. Cited in Kenneth Morgan, ed., The Path of the Budda (New York, 1956), p. 18. Ernst Mayr, What Evolution Is, 2001, Basic Books, p. 4. Lipschutz, Rabbi Yisrael. Derush Ohr ha-Hayim in Teferet Yisrael, Danzig (1845) quoted from Raphael Shuchat’s article “Attitudes Towards Cosmogony and Evolution Among Rabbinic Thinkers in the Nineteenth and Early Twentieth Centuries: The Resurgence of the Doctrine of the Sabbatical Year” (pp. 15-48), from The Torah U-Madda Journal (2005). In many ways, the renowned R. Abraham Isaac Kook (1865-1935) put forth a similar approach to that of R. Lipschutz in regards to evolution. Benamozegh, R. Elijah. “Il Mio Credo” found in Teologia-Dogmatica E Apologetica, Liverno (1877) Vol. 1, pp. 276-77 quoted from Raphael Shuchat’s article “Attitudes Towards Cosmogony and Evolution Among Rabbinic Thinkers in the Nineteenth and Early Twentieth Centuries: The Resurgence of the Doctrine of the Sabbatical Year” (p. 29), from The Torah U-Madda Journal (2005). Rabbi Menachem Schneerson, Mind Over Matter, pp. 32-3, Jerusalem: Shamir, 2003, from R. Natan Slifkin’s The Science of Torah. Though, Bertrand Russell pointed out that, philosophically speaking, it is possible that the world was created but a moment ago, and hence there was no real historical beginning to the universe; nonetheless, atheists, for obvious reasons, would not quickly consent to that alternative. One might wonder how it is that that machine was able to work given that there was no physical existence, but this technical question would not faze the atheist. Just as s/he does not ask who initiated the Big Bang, so too, s/he would not be interested in who turned on the creation machine; the atheists could argue that sometimes stuff like that just happens, and if it did not, we would not be here to question it. Soloveitchik, Joseph B. The Emergence of Ethical Man (New York: Toras HaRav/Ktav 2005), p. 6, quoted from R. Natan Slifkin’s The Science of Creation. One of the most hotly debated contradictions of Maimonides’ Guide for the Perplexed is found in 2:24. Unlike the work’s many alleged contradictions, the problem of 2:24 is unique in that it unquestionably contradicts an earlier argument. Indeed, this type of blatant contradiction is astonishing in light of Maimonides’ description of the type of contradictions that one could expect an author to make. In his explanation of the seventh cause for contradictory or contrary statements, Maimonides divulges that an author may choose to carry on two discussions which assume conflicting premises. In doing so, the author is able to conceal his true stance from the vulgar for whom certain information would be deleterious. Notwithstanding, the contention of 2:24 obviously and openly contradicts Maimonides’ argument put forth but a few chapters earlier. Furthermore, this contradiction is surprising for yet another reason. It assumes that Maimonides would, and indeed did, construct an argument only to pull the rug out from underneath it a few chapters later. In view of these perplexities, we will begin by explicating the actual contradiction and then go on to offer yet another reconciliation to the ever-expanding literature on this issue. However, regarding all that is in the heavens, man grasps nothing but a small measure of what is mathematical; and you know what is in it… the deity alone fully knows the true reality, the nature, the substance, the form, the motions, and the causes of the heavens. But he has enabled man to have knowledge of what is beneath the heavens… this is the truth. For it is impossible for us to accede to the points starting from which conclusions may be drawn about the heavens; for the latter are too far away from us and too high in place and rank. And even the general conclusion that may be drawn from them, namely, that they prove the existence of their Mover, is a matter the knowledge of which cannot be reached by human intellects. So, while Maimonides claims in 2:19 that he has a proof that God created the spheres, he subsequently undercuts that conclusion by arguing that no one may construct a demonstrative argument regarding the Mover, or anything else for that matter, based on the heavens. This is all the more surprising when we take into account Maimonides’ four apodictic arguments for God’s existence at the beginning of book two. Unlike Judah HaLevi who predicates belief in God on the collective experience of the Israelites in the desert,  Maimonides aligns himself with Sa’adya Geon and Bahya ibn Pakuda who put forth either teleological or cosmological arguments to prove God’s existence. In a comparable fashion, Maimonides proffers four proofs for God’s existence that follow from the twenty-six propositions recorded at the beginning of book two of the Guide. The four proofs logically follow from conclusions already demonstrated by Aristotle and his followers. Yet, while these arguments are philosophical in nature (formulated without the need to appeal to empirical data), Maimonides repeatedly claims that the best argument for God’s existence is drawn from the heavens. He says: “For it is the greatest proof through which one can know the existence of the deity – I mean the revolution of the heaven – as I shall demonstrate.” Similarly, he says: “We shall make it clear that there is no proof indicating to us the existence of the Maker, according to our opinion, like the indication deriving from the heavens.” In the accompanying footnote, Pines elucidates the latter assertion. He explains that “the meaning seems to be that the proof in question is the most convincing of all.” Even in the very chapter of the argument at hand, Maimonides puts forth a matching claim. He says: “[T]here is no proof of purpose stronger than the one founded upon the difference between the motions of the spheres and upon the fact that the stars are fixed in the spheres.” So while Maimonides claims to have proven God’s existence in the opening chapters of book two, several times he declares that the greatest proof of God’s existence is drawn from the heavens. But, the heavens – as Maimonides opines in 2:24 – cannot be used to prove God’s existence. Consequently, Maimonides’ arguments for God’s existence at the beginning of book two are also put into question. These problematic proofs for God’s existence only further highlight the force of the contradiction from 2:24. Numerous Maimonidean scholars and translators have proposed answers to deal with the contradiction stemming from 2:24. For instance, Samuel Ibn Tibbon was the first to pen a reconciliation to the contradiction in his translation of the Guide. He construes the abstruse passage from 2:24 to mean that all information gathered from the heavens is inherently unknowable to mankind, save the existence of the Mover. With this explanation, Ibn Tibbon makes 2:24 consistent with Maimonides’ conclusion from his earlier argument for God’s existence. However, this interpretation did come at a price. Ibn Tibbon is able to substantiate this interpretation only by inserting the phrase ‘aval she’ar inyanam’ (but everything else) into the text of the Guide. In Ibn Tibbon’s defense, though, it may not have been his intention that this addition be added to the actual text. Harvey has already pointed out that in the gloss to some manuscripts of the Guide, the additional words are attributed to Ibn Tibbon’s pen, and not to Maimonides. Joel L. Kraemer puts forth the surprising hypothesis that Ibn Tibbon may have “had a different text before him” and “proposes” what that missing text would have said. Kraemer attempts to deal with the contradiction by amending the text to read to exactly as Ibn Tibbon had already emended it. Kafah also follows a comparable approach to the contradiction in his translation of the Guide. According to Kafah’s translation, as understood by Davidson, he asserts that while the heavens do in fact demonstrate God’s existence, they cannot be used to demonstrate other matters. Harvey argues that Maimonides knew the argument from the heavens was unsuccessful, but by placing it alongside the proofs from “contingent existence to Necessary Existence,” Maimonides desired that his readers will ignore the unconvincing aspects of his argument, and take note of the argument’s positioning. This argument is placed at this juncture solely in order to call his readers to acquire scientific knowledge. Similarly, Shlomo Pines also maintains that the contradiction is meant to stand and was purposefully placed as such. He affixes a footnote to his translation of the 2:24 text that says, “In Ibn Tibbon’s translation the passage has a different meaning.” This, of course, implies that Pines rejects Ibn Tibbon’s reconciliation of the contradiction. A) Mankind can and does understand the workings of the sublunar world. B) Mankind comprehends the observational and mathematical aspects of the heavens, but does not grasp their ultimate reality. C) God alone understands the true nature of the heavens. It is not at all obvious, philosophically speaking, what led Maimonides to the latter two assertions; even his contemporary, Averroes, disagreed with Maimonides’ assessment of mankind’s capabilities of knowledge of the heavens. There is no ostensible reason to differentiate between how Aristotelian logic or syllogistic reasoning applies to the sublunar world and the heavens. And even if Maimonides is correct – if we cannot have true knowledge of the heavens – then why should we trust our mathematical or observational data about that realm at all? Quite possibly, those calculations are also inaccurate, and should be avoided when constructing a logical argument. All these [spiritual] forms are alive. They recognize and know the Creator with very immense knowledge, each of the forms according to its level and not according to its greatness. Even the highest level is unable to conceive of the true nature of the Creator as He [truly] is, since its intellectual capacity is too limited to know or to grasp [Him]. It does, however, comprehend and know more than the form which is below it. This is true regarding each and every level, including the tenth level. This [level] also knows the Creator in a manner that surpasses the potential to know and comprehend [God possessed by] human beings made up of body and soul. None [of these levels] can know the Creator as He knows himself. This ambiguity is not present by Maimonides’ estimation of the heavens. He opines that the heavens are superior to mankind. He candidly announces in our quote from 2:24: “For the latter [the heavens] are too far away from us and too high in place and in rank.” The heavens are not only physically above the human race, they are also metaphysically above. However, does this metaphysical chasm necessitate that mankind cannot understand but “a small measure of what is mathematical” about the heavens? Indeed, it does. In this one aspect, the heavens are more similar to God than to mankind. The reason we cannot know the true reality of the heavens is because we lack the intellectual capability. In this regard, we can draw upon the doctrine of divine attributes, and apply it to the heavens. This doctrine of Maimonides’ is his most well-known example of human intellectual failings. In short, Maimonides maintains that one may not attribute positive characteristics to God. He even goes so far as to say that one who does so “has abolished his belief in the existence of the deity without being aware of it.” The only way to garner true knowledge of God is through negative theology. Even terms that appear to be equally applicable to both mankind and God only seem that way; in truth, they are nothing more than homonyms. Maimonides spends most of book one proving these notions through a lexicographical study of a number of biblical terms. Maimonides concludes that mankind cannot access positive knowledge about God in any meaningful way. In a similar vein, mankind does not have access to the true reality of the heavens. While mankind can both observe the heavens and calculate its motions, these empirical facts rely on mankind’s limited observational abilities and his interpretation of that data. Both these factors suffer from fatal flaws: mankind is not sensitive to all that happens in the moon’s sphere and above, and second, there is no guarantee that mankind possesses the proper tools to satisfactorily analyze the given data; even Aristotle misinterpreted and misapplied his astronomical data because of certain faulty assumptions! In this regard, we are no better that the prisoners chained to the wall in Plato’s “allegory of the cave.” Mankind does not perceive the true reality of the heavens, but only a shadow of their true form. For that reason, all speculation about the heavens is suspect. Faur puts it succinctly in his summation that in “areas where no adequate tools of investigations are available, nothing can be known scientifically, and, therefore, knowledge is not certain.” Faur is correct in perceiving that Maimonides took for granted that a true knowledge of the heavens was beyond the boundaries of the human mind. Now, Maimonides’ declaration – which immediately precedes our problematic passage – comes into full view. He says that “the deity alone fully knows the true reality, the nature, the substance, the form, the motions and the causes of the heavens.” One should take care to note one of the facets on Maimonides’ list: the motion [of the heavens]. Maimonides – who was himself an expert astronomer well versed in the motions and rotations of the spheres as well as in the failings of other people’s calculations – would not even give in on this detail. While there is no reason to suppose that mankind could not eventually perfect the science of the spheres’ motions, Maimonides without chagrin claims that it will never happen. There is no reason for Maimonides to make such a bold assumption, save that he opines that mankind simply lacks a true understanding of the heavens. Now that we have proven that Maimonides indeed opines that logical arguments and syllogistic reasoning cannot be based on heavenly data, how do we account for Maimonides argument in 2:19 that God created the world be–kavanah based on the irregularity of the spheres’ motion? His unambiguous disavowal of information drawing from the heavens should negate any arguments drawing information from the heavens to get off the ground. Given that Maimonides includes this argument in the Guide, we would be remiss if we did not digress to examine the different types of arguments Maimonides recognizes as demonstrative. Maimonides explicates which arguments are available for constructing a demonstrative argument in his Sinā’at al-mantiq (Treatise on the Art of Logic). He enumerates four types of true knowledge available for arguments: sense percepts, intelligibles, generally agreed upon opinions, and opinions received through tradition. Defining the type of argument, as well as the type of knowledge employed in said argument is particularly significant by arguments which draw data from the heavens. The heavens possess the unique feature that facts pertaining to them may fall into each of the four categories. Depending on the type of supposition, the clout of the argument will shift between demonstrative, dialectical and sophistic. Now, we possess the tools to categorize Maimonides’ arguments. In truth, Maimonides does not have any demonstrative argument for God’s creation of the spheres be-kavanah – he cannot; he rules out the very possibility in 2:24. Accordingly, when Maimonides says: “For it is the greatest proof through which one can know the existence of the deity – I mean the revolution of the heaven – as I shall demonstrate,” he sincerely meant that it is the best argument for God’s existence, even though it lacks demonstrability. A serious look at Maimonides’ introduction to book two makes it perfectly clear that he never really intended to prove God’s existence. He says: “The premises needed for establishing (be-qiyum) the existence of the deity, may he be exalted, and for the demonstration (moftim) that he is neither a body nor a force in a body…” Four times in this short introductory paragraph Maimonides employs some version of the word ‘mofet,’ but when he speaks about proving God’s existence, he uses the word qiyum. He does not claim to go on to prove God’s existence demonstratively in the subsequent chapters; rather, he attempts to establish God’s existence based on both the first twenty-five demonstrative proofs, as well as the infamous twenty-sixth proposition. Accordingly, when we read his arguments in 2:1 and 2:19, we are not reading a demonstrative argument. In fact in 2:19, where his arguments for a purposeful (be-kavanah) God, as opposed to a God who acts out of necessity (żad ha-hiyuv) appear, Maimonides never claims to tender a demonstrative argument. He says “My purpose in this chapter is to explain to you, by means of arguments that come close to being a demonstration (be-ra’yot q’rovot le-mofet), that what exists indicates to us of necessity that it exists in virtue of the purpose of One who purposed.” Clearly, his aim in this chapter is to present dialectical arguments, not demonstrative. Accordingly, we could outright dismiss his claim from 1:71 that he will present mofet arguments; according to his own testimony, he only submits arguments that are close to mofet. Similarly, when Maimonides explains Isaiah 66:1 that “the heavens indicates (yoru) My (God’s) existence, grandeur, and power, as a throne indicates the greatness of the individual who is considered worthy of it,” one should not take the word ‘yoru’ to mean demonstrative. The heavens indicate His existence, but cannot be used to prove His existence demonstratively. In the end, Maimonides implicitly acknowledges that there are no arguments of this world that can demonstratively prove God’s existence. And everyone who engages in speculation, who is perceptive, and who has acquired the true knowledge of reality and does not deceive himself, knows that with regard to this question – namely the eternity of the world or its temporal creation – no cogent demonstration can be reached and that it is a point before which the intellect stops. In the end, the creation-eternity debate is beyond the ken of the human intellect. It remains in the realm of the dialectical, not because Maimonides lacks the proof to tip the scales in one direction, but because that proof does not exist in nature. Consequently, it should be no surprise that Maimonides requires such an exceptional person – he enumerates four qualities – to admit this heart wrenching fact. In Maimonides’ day, practically every religious and philosophical group laid claim to the ultimate truth in the creation-eternity debate. Maimonides, on the other hand, keenly observes that no party possessed the whole truth – demonstratively. This also explains why Maimonides knows with certainty that no proof for creation in time will be found in nature. After explaining that creation in time was the opinion of both Moses and Abraham, he says: “Do not turn away from the opinion according to which the world is new, except because of a demonstration. Now such a demonstration does not exist in nature.” The qualitative chasm that separates God and the heavens from the physical world preclude syllogistic reasoning from one realm applying to the other. Based on the first form of knowledge Maimonides enumerates, in his work on logic, that can be used to construct an argument – namely, sense precepts – Maimonides is quite certain that the sublunar world will not produce any proof for the eternity of the world. But how could he be so sure? Apparently, there is a qualitative chasm separating the physical world from its metaphysical counterpart and the feebleness of mankind’s intellectual feebleness precludes the possibility of his intellect ever being capable of bridging this gap. Hence, Maimonides explains by Job that “our intellects do not reach the point of apprehending how these natural things that exist in the world of generation and corruption are produced in time and of conceiving how the existence of the natural force within them has originated them.” Ours minds did not and will not ever comprehend the metaphysical underpinnings of the physical world. But, this does not obviate the possibility that the world could one day be demonstratively shown to exist eternally based on the second type of knowledge, intelligibles (leaving aside the third or fourth types of knowledge). This is why Maimonides says: “Now such a demonstration does not exist in nature (emphasis mine).” Maimonides cannot rule out this other possibility, even though he maintains that creation in time was the opinion of both Moses and Abraham. In summation, we have seen that the heavens truly cannot be used to construct a dialectical argument (opposed to Maimonides claims in 2:19). Their nature is so totally different from anything a human could comprehend that whatever one concludes about them will inherently be faulty in some aspect. For the same reason, one cannot construct a demonstrative argument to prove God’s existence, and thus Maimonides does not really believe that he proffered a demonstrative argument for God’s existence. Accordingly, whenever Maimonides claims he has proven, or will prove, God’s existence demonstratively, he has some ulterior motive in mind. Appendix: The findings of this paper take Pines’ conclusions in his article “The Limitations of Human Knowledge According to Al-Farabi, ibn Bajja, and Maimonides” to their natural conclusion. While he opines that Maimonides takes an agnostic stance towards metaphysical knowledge, we are asserting that Maimonides would take an agnostic view towards arguments for God’s existence as well, which rightfully so, ought to be included in metaphysical knowledge. In other words, short of prophetic inspiration (and possibly even with it), a philosopher can never arrive at demonstrative knowledge of God’s existence. If Davidson took such an unenthusiastic stance towards Pines “startling new thesis,” one can only imagine how he would respond to the findings in this paper. In light of the criticism that one can rightfully lodge at the conclusions of this paper, we will proffer several other reasons to accept these findings and show why this thesis would not be solely “born within the context of contemporary Maimonides’ scholarship.” First, let one of the fine points of this paper be clarified; it is not that knowledge of God is impossible; rather, knowledge of God that is demonstratively proven (dalla) is impossible. a. The most important proof for these findings is that Maimonides dilly dallies in regards to his arguments for God. Not only does he claim to have proffered arguments that simply do not exist, he even says that he will offer the best argument for God, but then goes on to undercut that argument in 2:24.
b. The four apodictic arguments for God’s existence require the twenty-sixth premise in order to be valid. It should, at least, be questionable that Maimonides employs a controversial proof in a demonstrative argument. According to the policy he established for constructing a demonstrative argument, one may not employ contentious proofs. While Maimonides tries to do his readers a favor by proving God’s existence in two separate ways: by assuming the world’s eternity and then by not, it would be prudent for us to remember that if we base an argument on a premise that is dialectical, obviously, the conclusion is dialectical. This is still the case even if Maimonides uses P & –P in his argument, for while modern logic would accept the validity of an argument that follows from P & -P, Maimonides would not deem that argument philosophically worthwhile for, in truth, it is not demonstrative. c. Davidson is irked over the fact that Maimonides asserts numerous details regarding God. For example, both in the Guide and in the Mishneh Torah, Maimonides makes clear that God “is the intellect as well as the intellectuality cognizing subject and the intellectually cognized object, and that those three notions form in Him one single notion in which there is not multiplicity.” Technically, this is a positive assertion about God. In truth, Maimonides has no problem asserting positive attributes about God as long as the reader is aware that they do not represent God’s true reality. Because God’s knowledge is unlike ours, his intellection is completely different too. Maimonides accepts the dictums of the philosophers that are generally accepted because they allow one to speak intelligently about God. They allow mankind to legitimately reflect upon God’s existence. d. Pines argues that Maimonides’ assertion in 2:24 that “Moses is the only human being that may be assumed to have had this knowledge” implies that Maimonides “considers that man can have scientific knowledge only of the phenomena of the sublunar world… Maimonides is of the opinion that no scientific certainty can be achieved with regard to objects that are outside the sublunar world.” Davidson rejects that Maimonides is putting forth “a radical epistemological skepticism,” in this statement, but there is not really a better way to read it. Sure, it may be surprising to perceive just how different Maimonides viewed Moses from the rest of the human race, but that is not a reason to deny that Moses was truly that different. בזמן שאדם מתבונן בדברים האלו ומכיר כל הברואים ממלאך וגלגל ואדם כיוצא בו ויראה חכמתו של הקב”ה בכל היצורים וכל הברואים, מוסיף אהבה למקום ותצמא נפשו ויכמה בשרו לאהוב המקום ברוך הוא, ויירא ויפחד משפלותו ודלותו וקלותו כשיעריך עצמו לאחד מהגופות הקדושים הגדולים, וכ”ש לאחת מהצורות הטהורות הנפרדות מן הגולמים שלא נתחברו בגולם כלל, וימצא עצמו שהוא ככלי מלא בושה וכלימה ריק וחסר. Accordingly, Maimonides explains that he recorded these chapters on metaphysics and physics in order to inform his readers “how to add to his love for God,” not just so they should gain knowledge of God. All the information on ma’aseh mirkava becomes a subcategory to the prescription to love God. Accordingly, philosophic knowledge is valuable in so far as it lends to love of God; otherwise, Maimonides should have included the information in these three chapters (or at least chapter two) within the first chapter of the Mishneh Torah where he describes the biblical prescription to acquire knowledge of God. As much as Maimonides denies the validity of the Kuzari’s God from tradition, this seems to be the exact God in which Maimonides is relegated to prescribing people to believe in, but for philosophical reasons. Maimonides does put forth all the philosophical knowledge of his days that points to God’s existence, but even he must admit in the end, that all these arguments failing is exactly the God he presents in the Mishnah Torah. In the end, we have to ask: why would Maimonides spend so much time on arguments for creation when none of them work, on arguments for God’s existence when they all predisposed to a crucial flaws, on describing God when even he candidly fesses up that, ideally, silence would be a better option than prayer? Like the prophets and Sages before him, Maimonides employs arguments that are dialectical (or authoritative) in order to buttress a reality which lends support to what the religious community ought to believe. In truth, the contradiction between 2:19 and 2:24 is one of the few clear examples of Maimonides systematically employing the seventh cause for contradictory or contrary statements. And while the Maimonidean commentators have all thought of ingenious ways to circumvent the contradiction, sometimes one must sit back and brood over the fact that a cleverly placed contradiction is not something to “answer up,” but something to appreciate. All Hebrew references are taken from the Ibn Tibbon translation and all English references are taken from the Pines translation and the page references are to this work. This type of argument is a version of the theological argument for particularization found in Alghazali’s writings. This is idea is reinforced by the prophetic revelation that Job experienced. Maimonides explains that Job realized that “there is no going beyond the description of natural matters – namely, description of the elements or description of the meteorological phenomena or description of the natures of the various species of animals, but of nothing else” (Guide 3:23 p. 496). The implication of the last phrase – “but of nothing else” – is that mankind has no access to the true reality of the heavens. The four proofs are summarized in J. David Bleich’s With Perfect Faith: The Foundations of Jewish Belief (Ktav Publishing House: New York, 1983) in the chapter on the “Existence of God,” p. 78. Joel L. Kraemer’s “Maimonides on Aristotle and Scientific Method ,” from Moses Maimonides and His Times, ed. Eric L. Ormsby (The Catholic University of America Press: Washington, 1989), pp. 53-88.
 p. 79; it is possible that Kraemer was unaware of Harvey’s observation in the Guide manuscripts. Herbert A. Davidson’s “Further on a Problematic Passage in the Guide for the Perplexed 2:24” from Maimonidean Studies, vol. 4, ed. Arthur Hyman (Yeshiva University Press: New York, 2000), pp. 1-13. Jose Faur in his Homo Mysticus (Syracuse University Press: Syracuse, New York, 1998) argues that in the fields of metaphysics and astronomy, certainty is unattainable, istidlal is mankind’s only possibility. Mankind lacks the proper tools to reach certainty regarding theological matters for “burhan transcends the human faculty” (p.103). In other words, demonstrative proofs can only be produced from information that one has direct experience of. Like Davidson, for Faur, God’s existence could be inferred from the heavens, but cannot be demonstrably shown. Though Maimonides’ argument in 2:19 is deficient, working along side the subsequent argument, Maimonides goads his readers to acquire scientific knowledge. Like Averroes, Maimonides completely believes that Aristotle possessed perfect knowledge of the sublunar world. For example, he says that “everything that Aristotle has said about all that exists from beneath the sphere of the moon to the center of the earth is indubitably correct, and no one will deviate from it unless he does not understand it or unless he has preconceived opinions that he wishes to defend or that lead him to a denial of a thing that is manifest” (2:22 p. 319). There are many other such examples throughout the Guide. Even Aristotle’s knowledge of the heavens was wanting. Maimonides says that “Aristotle expounds with regard to the sphere of the moon that which is above it, except for certain things, something analogous to guessing and conjecturing” ( 2:22 p. 320). Averroes, on the other hand, felt that the knowledge of astronomy regressed in his day and that Aristotle had possessed a true knowledge of astronomy. Maimonides accepts that logical impossibilities are beyond God’s capabilities. This is evident from his discussion of Platonic philosophers where he explains that “His not bringing impossible things into existence does not argue a lack of power on His part – since what is impossible has a firmly established nature” (2:13 p. 283). But, this assertion – God’s inability to perform certain acts – is based on “what has a firmly established nature,” and that nature is firmly established by human logic working in the sublunar world. Unfortunately then, astronomers’ conclusions would be both be meaningless and worthless. In truth, Maimonides asserts that the job of the astronomer is functional in that he is to postulate the fewest orbits at a constant velocity for the spheres, regardless of whether his system represents reality as it truly is. See Menachem Kellner’s “On the Status of the Astronomy and Physics in Maimonides’ Mishne Torah and the Guide of the Perplexed,” from British Journal for the History of Science 24, 1991, pp. 453-63. While aspects of the heavens would be identical with the angels in Maimonides’ schemata, the point made in this paragraph refers solely to their visual aspect. See Mishneh Torah, Yesodei HaTorah, chapter 2:4-8. See Howard Kreisel’s “The place of Man in the Hierarchy of Existence in the Philosophy of Ibn Gabirol and Maimonides in Alef Shefer: Studies in the Literature of Jewish Thought, ed. Moshe Hallamish (Ramat-Gan: Bar Ilan University Press, 1990). Strauss explains in his introductory article preceding the Pines translation of the Guide: “the Law agrees with Aristotle in holding the heavenly bodies are endowed with life and intelligence and that they are superior to man in dignity; one can say that he (Maimonides) agrees with Aristotle in implying that those holy bodies deserve more than man to be called images of God” (p. xxiii). In the Guide 1:52, Maimonides says: “It is clear at the first glance that there is no correlation between Him and the things created by Him” (p. 117). This implies that the heavens share a greater affinity with mankind than with God. And not because mankind lacks the mathematical know-how. If that were the case, then Maimonides would not be so pessimistic about mankind ever acquiring a true knowledge of the heavens. Furthermore, see Guide 1:73 p. 209 where Maimonides links knowledge of a thing’s causes with knowledge of it true reality. Jose Faur Homo Mysticus, (Syracuse University Press: Syracuse, New York, 1998), p. 103. Faur’s reasoning, though, is faulty. He anachronistically superimposes a modern skepticism (based on the common criticism lodged against inferential logic) upon medieval Aristotelians logic. He rightly claims that only istidlal (inference) is possible by astronomy, and not certainty. But, he then explains this contention by appealing to the fact that “scientific knowledge is restricted to areas that can be submitted to direct analysis. Thus ‘certainty’… is not operative in areas such as metaphysics and astronomy. There is no reason to acquiesce to Faur’s version of metaphysical skepticism. A) Al-mahsūsāt (ha-muhashim, sense percepts) – all mankind views the stars: their color, their shape, their size, etc. B) Al-ma’qūlāt al-awwal, (ha-muskalot, first intelligibles) – there are many self evident propositions in regards to stars; for example, they are exceedingly far away or the moon is closer to earth than the stars. C) Al-mashūrāt (ha-mefursamot, generally agreed upon opinions) – for example, the substance of the stars is inherently different than the matter sublunar items are made from. D) Al-maqbūlāt (ha-mequbalot, opinions received through tradition) – the Talmud records countless traditions about the heavens. See the end of 1:31 where Maimonides writes that “the external meaning is indicative (yoru) of the corporeality of God” (p. 67). See also the end of 1:53 where Maimonides explains the way in which we should understand the divine attributes in Tanach. He says: “This is what ought to be believed with regard to the attributes mentioned in the books of the prophets; or, as we shall make clear, it may be believed with regard to some of them that they are attributes indicative (yoru) of a perfection likened to our perfections, which are understood to us.” In all three instances of the word ‘indicative (yoru), Maimonides employs it in a dialectical fashion that is based on the fourth type of knowledge we mentioned above, namely, ‘opinions received through tradition’ (ha-mequbalot). Similarly, when Maimonides explains that “there is no proof indicating to us the existence of the Maker, according to our opinion, like the indication deriving from the heavens” (2:18 p. 302), he truly believes that the heavens produce the best argument for God’s existence even though the argument will not be demonstrative. Even when God made known the proofs for His own existence to Moses to be given to the Israelites’ “men of knowledge,” Maimonides employs the word ‘dalil’ (ra’yah, proof) instead of mofet (1:63) because, it seems, even God cannot provide demonstrative proof for His existence. Though, it is possible that Maimonides understands that God gave a dialectical proof to Moses because he knew that would be effective. Guide 1:71 p. 180. Similarly, Maimonides says: “I shall make it clear that just as a certain disgrace attaches to us because of the belief in the creation in time, an even greater disgrace attaches to the belief in eternity” (2:17 p. 294). In other words, neither opinion can be demonstrated. Strauss in his introductory essay to Pines translation of the Guide: “Creation is according to Maimonides not demonstrable, whereas God’s unity and incorporeality are demonstrable” (xxiii). Accordingly, Maimonides says: “For this reason that there is no stronger proof of [God acting] purpose[fully] stronger than the one founded upon the difference between the motions of the spheres and upon the fact that the stars are fixed in the spheres] you will find that all the prophets used the stars and the spheres as proofs for the deity’s existing necessarily,” (2:19 p. 310) even though the argument is not demonstrative. That was the job of the prophet. Maimonides maintains that one of the goals of philosophical training is to turn religious beliefs, generally inculcated from tradition and/or authority, into certain knowledge. In the Guide (3:23 p. 492-3) Job’s shift from traditional knowledge to certain knowledge comes to culmination with the appearance of the whirlwind. How could this take place; what was Job made aware of? It seems he was only made aware of the fact that he cannot understand. In this context, this was definite knowledge. The essay was published in Isadore Twersky’s “Medieval Jewish History,” vol. 1 (Harvard University Press: Oxford, 1990), pp. 82-109. See his article “Maimonides on Metaphysical Knowledge” from Maimonidean Studies, vol. 3, ed. Arthur Hyman (Yeshiva University Press: New York, 1993), pp. 49-103. Davidson, “Maimonides on Metaphysical Knowledge,” p. 54. Pines, “The Limitations of Human Knowledge According to Al-Farabi, ibn Bajja, and Maimonides,” p. 93. Faur explains: “The aim of the theologian – unlike the philosopher – is not to expose the truth but to defend and promote a set of doctrines” (95). I welcome death: not to be lowered into hollowed out earth, or to perceive a snapshot of the afterlife, but to greet the sullied concept into the vicissitudes of my daily life along with everything else trite. Now that I am in my thirties, death trickles in… In youth, most people know no death. Maybe a grandparent or a dog, but those are exceptional, special, sad. Death, however, is not common then. With an overdose here, a suicide there and an occasional freak accident, eventually death knocks at our everyday door for entrance, to be welcomed into our mundane lexicon until it becomes as common as the morning sun. I’m excited everyone is finally catching up. For me, death has always been there, or at least since my father’s death. Most people can recall vividly their worst memory. Not because of its impact, but because it’s sealed within you without any hope of extrication. One sight on the day of my father’s death is that memory. I had not known my father was dying. He had cancer for several years, but I was twelve and stupid. This sounds surprising, and even amusing in its naiveté, but I had not known that my father could die. It was not a possibility that my mind ever broached. It never entered my train of thought, no matter how sick or lifeless he was. I did not deny the future, but simply did not recognize it. On the last day of his life, I went to school. In fact, I remember my younger brother remained home, and I was angry that he was taking advantage of my sick father’s situation. After all, my brother was not sick. He should go to school along with me and my other two siblings. But he cheated my mother, or so I thought, and fooled her. While she knew this was my father’s last day of life, and kept my younger brother at home purposefully, that explanation never crossed my mind at the time. When we returned home around four o’ clock, there were no less than fifteen cars sprawled throughout my driveway, front lawn and parked in the street. I had never seen so many cars flooding a house’s façade. Every inch was covered with cars. I had no memory to compare this sight with. But. It hit me then, as quick as a gunshot. He’s dead. To this day, I don’t understand how I made the leap from father to dead father, but it was instantaneous. Maybe the idea of his immanent death rest is my subconscious, but that sight of those cars permitted the notion of death to barge immediately in. The second we got halfway down SW 32nd Terrace, the bend in the road quickly revealed my house and those cars, and I knew he was dead. I didn’t know the next step, or the emotions to stream or how to feel at all. Death was not part of me. But, I evolved. Death was part of me. I felt comfortable with joking about death, jokes of the Holocaust, AIDS, cancer. These jokes and comfortability with death has made some people feel uncomfortable, but that was OK. They would learn from my wisdom, eventually. My newly formed outer shell made me immune to the sensitivities of regular folk. I felt a special kinship with those who also experienced the death of a parent. We knew something that no one else knew, even if we could not articulate it. Death was in me, and I was proud of it. I was better. I could wear death on my shoulder like a war wound, whip it out when I desired a laugh, sympathy or just to continue an awkward conversation. Death is interesting, and I was better for owning it. It made me stronger, and more dominant. But my calm and security with death was/is odd to some. Two thousand years ago, the average life expectancy was under thirty years of age. Death was common, and part of the vernacular. He who knew no death at all stages of life was impossible. We live in the first century where I can wear death proudly as an anomaly. But that also dissipates with time. Death is creeping up, trickling in, on my peers finally. They soon will wear her, not as a sign of pride as I did, but as one wears wrinkles and bad knees. It’s different. They will never experience it as I had it, but I’ll take what I can get. I’m excited that life’s tide is pulling back to reveal death’s shore. Soon you will be me too. Is Kayin the Son of the Angel of Death? Picking up on the odd formulation that Chava has “acquired a man with God”, Targum (pseudo) Jonathan1 reinterprets the beginning of the pasuk as well. It is not that Adam knew Chava in the classical sense- rather, he knew (or found out) something about her. “And Adam knew about Eve his wife that she was desired by an angel, and he [the angel] knew her, and she bore Kayin, and she said “I have acquired a man with an angel of God”. “And Adam knew his wife Eve, etc.”: According to the Midrash, the meaning of “he knew” is that “he understood”, from this that his [Kayin’s] appearance was not from those below, but was from those above, therefore he knew that the angel Samael desired her [Chava] and came upon her 3. So in this explanation, the angel who impregnates Chava was not just some angel. Rather, this was Samael, who may be identified with the Angel of Death, or the Yetzer Hara/Satan4. He could be citing Pirkei D’Rabi Eliezer, chapter 21, since his phrasing is similar to it5. At any rate, I think this is a fascinating interpretation. In it, of course, Shet is the second son of Adam, not the third, and he and the murdered Hevel are only half brothers with Kayin, who is only half human, and may even be the son of the Satan himself (quite logical then, that he is the first to shed blood). Further, things become even more interesting when we note that this midrash, which says Kayin is the son of Samael, also says that he is the first to do teshuva (see also Psikta DeRav Kahana Shuba 11 and Ramban and Ibn Ezra to Gen. 4:16). Additionally, in chapter 22, the Midrash notes that all wicked generations descend from Kayin, which is easy to take in a non-literal sense (ie. they follow in his ways, though his descendants were killed out in the flood), or in a literal sense, that those who are evil are acting on the genetics passed on from Kayin (in which case, some of his descendants survived the flood6). If the latter is the true intent, then much of the world (all of it, perhaps?) is descended from Samael. 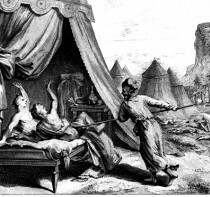 3The best that I can tell from a short Bar Ilan search is that “Ba aleha” in the Mishnah appears to be consensual, though in contexts where the behavior is not approved of, or is a sin for some other reason. In Tanakh, the term appears to have to do with battle or land, so that it doesn’t appear in a context which seems to me to be directly relevant. Please let me know if I have misinterpreted, however. Rabbah Beshalach, 21, Devarim Rabbah, V’zot HaBrakhah, 21. 5 The same idea appears in chapter 22 there as well. 6 eg. through Naama, as in Midrash Rabbah, cited by Rashi on Gen. 4:22. Aaron, the High Priest, should have been Executed! Aaron, Moses’ brother, should have been executed for the sin of the Golden Calf. If not through the plague that ravished the nation (Exodus 32:35) “because of what Aaron did,” then possibly when Moses rallied the Levites (Exodus 32:17) to execute 3,000 of the Golden Calf participants; if not then, there was still another chance to Divinely off Aaron when Moses forced the Israelites to drink the ground-up Golden Calf-water mixture (Exodus 32:20). In a failed attempt at exculpating his actions, Aaron throws out the disclaimer: “you know the nation is evil (Exodus 32:32), only further validating his guilt. True, Moses interceded on Aaron’s behalf (Deuteronomy 9:20), but then again, Moses himself also rebuked Aaron (Exodus 32:21-4), as Aaron was guilty of breaching the Israelite religion’s most basic proscription. As a witness to these events, the charge of nepotism must have appeared even stronger than when Aaron and his family were handed the Israelites’ eternal priesthood. Everyone actively involved in the Sin of the golden Calf is killed, save Aaron. As Aaron survives the incident, he remains a candidate for the position of Kohen Gadol. But, when we take a step back, the fact that Aaron becomes Kohen Gadol is surprising, to say the least. Rabbinic literature assumes that the Israelite firstborns were originally intended to serve as the Israelite priests, but because of their role in the Sin of the Golden Calf, this honor was wrested away from them and handed over to the Aaronic family and the Levites. Indeed, originally Moses along with the rest of the Israelite leadership sent the “Israelite youths” (who Rashi identifies as Israelite firstborns) to enter into a covenant with God on behalf of the twelve tribes (Exodus 24:5) and later the Torah states that God sanctified the firstborns when he did not kill them in Egypt (Numbers 8). Nonetheless, eventually the firstborns are swapped for the Levites (ibid), without a reason being offered. Ironically, there is not even a whisper of firstborns transgressing by Sin of the Golden Calf (despite Rabbinic literature’s pronouncement), while Aaron is rightfully fully chastised; and yet, firstborns lose their choice status, in lieu of the least likely candidate! There is an ambiguity in most people’s memory of the narrative which stands at heart of this matter: when does Aaron become a Kohen? On the one hand, one sedra earlier (Exodus 28 & 29), the process prescribing the sanctification of the Aaronic family for priestly service is found. As this sedra appears before the Sin of the Golden Calf, if one assumes the Torah is written in chronological order, it would be impossible to defend the premise that the Aaronic family only became the priestly family after the Sin of the Golden Calf. On the other hand, if the Aaronic family only became the priestly caste right before the erection of the Tabernacle, then we revert to the question of why: why would they be deserving after Aaron sinned so heinously?! The worship in the Tabernacle is the Israelite religion’s way to worship God. Most other forms of worship were completely unacceptable. But, the commentators argue over whether it had to be that way. Ramban argues that humans have a natural drive to serve God, and depending upon a society’s resources, humans will serve the Deity however they can. 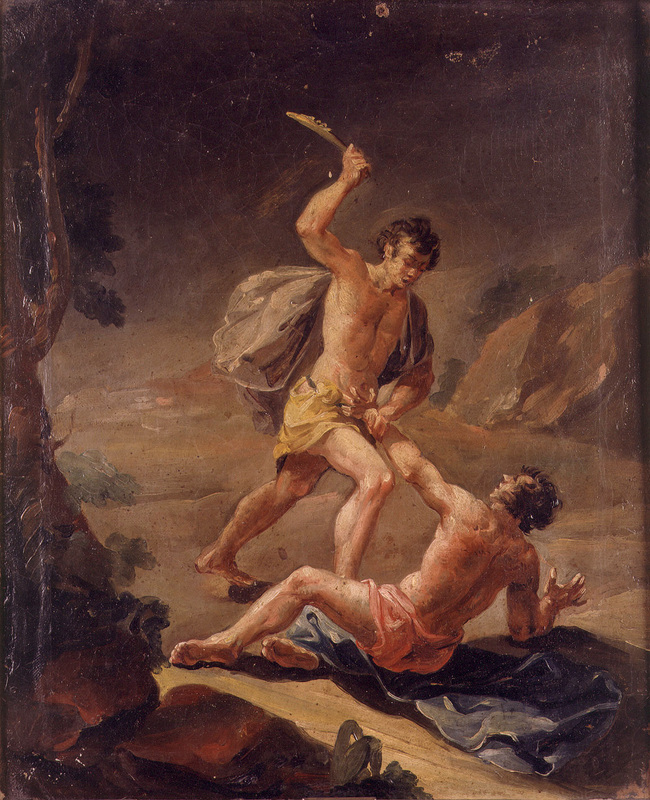 Ramban offers the example of Cain and Abel’s offerings. Never was Adam or his two sons Divinely ordered to serve or praise the Divine Being: Don’t eat some fruit: yes, serve God through sacrifices: never prescribed. Accordingly, when Cain and Abel decided to offer animal and fruit offerings (Genesis 4), they were tapping into an underlying psychological drive to worship God through physical means. Or maybe, they just felt like it was the right thing to do. Either way, the Ramban cites this example as proof that sacrifice and offerings always existed, and would have existed had the Israelites sinned by the Golden Calf or not. Rashi, on the other hand, offers a different understanding of offerings. Rashi contends that the existence of the Tabernacle, of priesthood, prescribed offerings and times, etc. are a consequent of the Israelites failing by the Sin of the Golden Calf. Without that mistake, the Israelite firstborns would have been the sole priests for the nation. Every family would have its own personal priest, instead of one family owning all the priestly positions. When one understands the fundamental reasons behind the two positions, it becomes clear that Rashi and Ramban are not that far apart from a worship perspective. Rashi would agree that Cain and Abel brought free will offerings. Indeed, even after the Tabernacle’s erection, free will offerings still existed. But, that should not undermine the obligatory elements of Temple service. Priesthood, in its ‘post-sin of the Golden Calf incarnation’ actually incorporates both elements: obligatory and free-will offerings. Originally, firstborns would have offered whatever offerings they chose, but after the sin of the Golden Calf, only the Aaronic family could offer these offerings on behalf of families. Unhindered religious expression is too dangerous a tool for most people, so it was taken away from the Israelites and handed over to one people. According to Rashi, this was the necessary consequent of the Sin of the Golden Calf. The sin was rooted in the people’s false belief that anyone can access God however they want (through whatever means they want), so God had to repudiate such a juvenile notion. But why was Aaron chosen for this role? 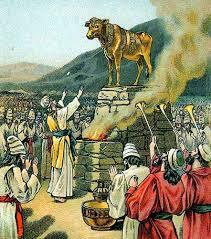 According to Rashi, the Tabernacle only existed as a consequence of the Sin of the Golden calf. As Aaron lead the Israelite towards the Sin of the Gold Calf, he should not have even been a candidate for the position. Really, he should’ve been killed with everyone else who sinned with the Golden Calf! In truth, the choice of Aaron as the High Priest was his punishment. He took it upon himself to lead the Israelites down the road of arbitrary (idolatrous) worship. Instead of insisting that the worship of God be underscored by basic monotheistic principles, he allowed for arbitrary worship to take place: worship that was authentic and genuine, but misguided. His punishment was that he would have to be on top of one of the most fussy, nitpicky and meticulous systems of worship ever prescribed. This is no coincidence. This is the exact punishment that one would expect for Aaron and his family considering his sin was creating an idolatrous vehicle for the worship of God. So, the Aaronic Priesthood is a mixed blessing. It has both positive and negative elements. First, it took on all the positive elements of a human’s natural desire to serve. Through the priest, people can offer free will offerings. But, those offering are limited in scope, in times, in how they have to be eaten, killed, burnt, etc. These regulations are the punishment (or the tikun) for the misguided belief that caused the creation the Golden Calf. When Aaron’s two sons (Leviticus 10:1) die because they offer an unauthorized offering in the Tabernacle, Aaron remains silent. He understood that he was originally spared by God for the sole reason to teach others that worship of God cannot be about themselves. Of course, he could not comment upon their deaths and took their deaths as a fact of life. It is not without irony that we note that Aaron’s firstborn, Nadav, died in this incident. It would be disingenuous had God permitted Aaron’s firstborn to serve in the Tabernacle in lieu of all the Israelite firstborns, considering that Nadav’s father, Aaron, is the one that brought about this change. He had to die. (1) The only mention of this swapping process is found in Numbers (chapter 8) where it states: “[The Levites] are given to me from among the Israelites in place of the firstborns.” While Aaron is never singled out as earning his status in place of firstborns, the Torah states that God is “giving the Levites to Aaron and his sons” to work in the Tabernacle. Not only is he now High Priest, but all priests and Levite families are his admins! Kill the Copts… No Kill the Syrians… No Kill the Jews! This past month a church in Minya, Egypt was forced to cancel Mass for the first time in 1600 years. While over the past two millennia the Coptic Church has experienced no shortage of anti-Christian sentiment and persecution in Egypt, the lawlessness towards Christians hit a zenith recently. 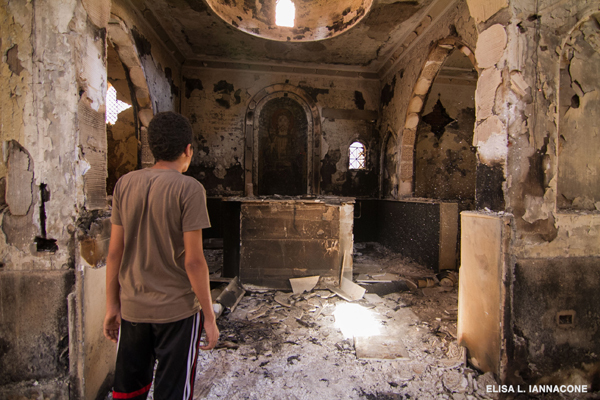 For Copts, distancing themselves from their holy sites – if those edifices still happen to stand – was the only reasonable course of (in)action considering the utter brutality carried out against the Copt’s infrastructure. In fact, in the last two weeks, 37 churches have been destroyed, scores of Christian businesses ransacked and several worshipers have been killed by Muslim Brotherhood members. As the Brotherhood represents the pro-Morsi Islamicist side of Egyptian politics, Copts – as Christians – are (rightfully so) seen as siding with the army and pushing for a strong, secular Egyptian government. While Copts make up about ten percent of the Egypt’s ninety million strong population, this nine million person minority clearly experiences the daily pangs of Islamicist persecution. While Egypt experiences a taste of civil war, Syrian civilians – especially around Damascus – suffer the real thing daily. With China and Russia obstructing the UN from taking a unified stance against Assad’s regime’s killing of civilians, most Western powers feel chained by the specter of Iraq and the belief that unilateral action is unfavorable, and must be shelved as the preferred method of a true world power. Allow me to raise the following hypothetical: if Jews still remained in Egypt or Syria, what would be their plight? As we can be certain our imagined Jewish minority would have voted against Morsi and the Muslim Brotherhood in post-Mubarak elections last year, would their plight be any different from the Copts? Could we even suppose that this Jewish minority – representing significantly less than the ten percent of the Egyptian population that the Copts claim – would not have been persecuted? Indeed, we could be sure that a mini-Kristallnacht would have been perpetrated against the Jews over the last month. On the Syria front, what if Jews had not trickled out of Syria since 1948? In truth, the world cannot even protect Sunni Muslims from the Shiite and Alawite ruling party of Syria. As Assad kills thousands of innocent civilians, gases cities and brutally tortures traitors to his cause, what would be the plight of the 2013 Syrian Jew had they not fled over the last six decades? Ought we to believe that the world would intervene if these Syrian Jews were genocidally killed during the Syrian revolution? Syrians cannot even protect themselves from their own cruel regime with over 100,000 murdered and counting, and as pointed out above, Russia and China obstruct world efforts to intervene. Would the world, today, intervene to save the Syrian Jew? The Christians of Egypt can claim over a billion Jesus followers worldwide who can do nothing for them but watch in horror. Sunni Muslims also enjoy over a billion adherents, but no one intervenes. So, would someone stand up for our hypothetical Jew? The only reason that a Holocaust does not occur today is because there are no Jews left in all those Arab lands, and those Jews happen to be reasonably safe in Israel already. Let not one of us lie to ourselves and believe that in 2013, our contemporaneous Human Rights Council or the world’s sense of morality and ethics would prevent a Holocaust against Middle Eastern Jewry in Arab lands if not for the safe haven that is State of Israel. Only through Israel is there life for these Jews! Rabbi Emanuel Rackman received smikha from Rabbi Moses Soloveitchik, and an LLB and doctorate of philosophy from Columbia University. He was the rabbi of the 5th Avenue Synagogue, the provost at Yeshiva University, and the chancellor of Bar Ilan University for many years. In this short expression of faith, Rabbi Rackman tells us that revelation is a historical fact, its historical reality is crucial to his faith, and that he’s not sure how it took place. This presumably means that like most of us, he does not know how prophecy works. I’m not sure what Rabbi Rackman’s intent is in this comment. Does he mean that God encountered man, who wrote down or preserved pieces of prophecy, before Moses rewrote it from scratch through his own prophecy? Or when he suggests that “much of it may have been written by people in different times”, does he simply mean that indeed, the Bible may have multiple authors, because the patriarchs wrote down their prophetic experiences which were supplemented and perhaps edited by Moses, who wrote the “eternal evidence of the covenant between” God and the Jewish people? This view seems to imply something which our first quote did not: perhaps when God, through prophecy, instructed Moses to write and edit the Torah, the instruction was to include materials which were not originally prophetic at all! Returning to Rabbi Rackman, it is also important to note that in his opinion, the “definitive record” of God’s meetings with man (ie: the Written Torah) was accompanied by an Oral Torah, which included rules to understand every word of its written counterpart. Does Rabbi Rackman’s overall position, if I understand it correctly, open up the possibility for the kind of vision Rabbi Zev Farber shared in his controversial essay on TheTorah.com? I don’t know, and as I continue to read the book, I’ll revise this post if I find important supplementary points or something which contradicts what I’ve said here. What Are Rambam’s 13 Principles of Faith?